Bottle warmers make it easier to heat breast milk without losing the important nutrients. A built-in steriliser makes it easier to clean the bottle and BPA-free models do not have hormone-releasing substances. 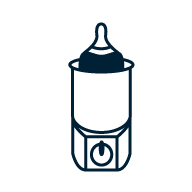 An automatic shut-off provides the perfect temperature and a light indicator shows when the breast milk is heated.